A photo of the male black-necked stork spread on birding forums this week and captured international attention. A bird whose beak was sealed shut by a plastic ring and whose plight captivated social media has been rescued, wildlife officials said Wednesday. A photo of the male black-necked stork spread on birding forums this week and captured international attention. A birder named Manoj Nair snapped the photo last Thursday evening in a wetland in Gurgaon. Birders and state wildlife officials then mounted a frantic search for the bird, which was finally captured Wednesday and taken to a bird sanctuary nearby for treatment. The stork is dehydrated but nibbled on a small fish and is in surprisingly good condition despite going without food for at least seven days, Nair said. The stork, classified as "near threatened," became the latest international symbol of harm that global plastic waste is doing to wildlife - from a turtle with a plastic straw lodged in its nostril to a pilot whale that died off Thailand earlier this month with 80 plastic bags in its stomach. About 8 million metric tons of plastic pollute oceans each year, according to a 2016 report by the Ellen MacArthur Foundation. 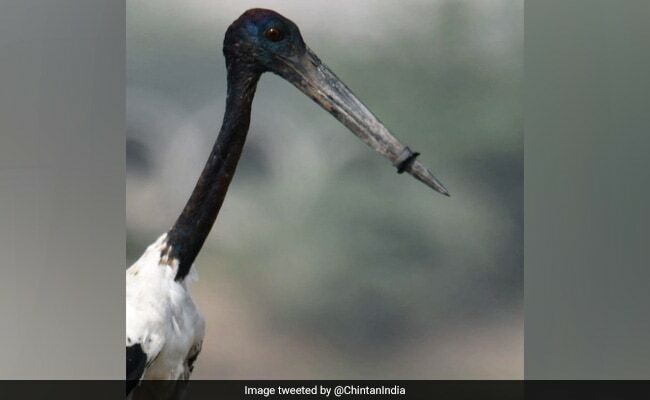 The stork, a male about 5 feet high, was found in Basai, considered by environmentalists a key wetland habitat for birds, fish and other wildlife. But it is not an officially protected wetland, according to the state government. Although it attracts thousands of migratory and other birds such as storks, flamingos and herons, the area has been used as a dumping ground by a bottling company and for other trash, birders said. 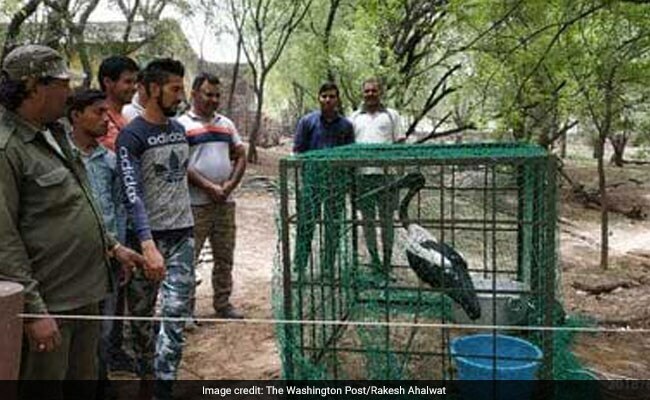 Sunil Tanwar, a Haryana state wildlife inspector, said foresters and birders camped at the wetland since Thursday as temperatures soared to more than 105 degrees, hoping to capture the bird. The stork managed to elude them until finally giving in to his captors Wednesday morning. "He's a very clever bird," Tanwar said. The ring easily slid off the exhausted stork's beak, Tanwar said. The bird will be released into the wild as soon as officials at the Sultanpur National Park and bird sanctuary deem it fit. Just days ago, Prime Minister Narendra Modi began a high-profile effort to eliminate single-use plastic by 2022, as well as an immediate ban on its use in Delhi. About 50 nations are attempting to control plastic waste, including Sri Lanka and China, which is moving toward biodegradable bags, according to a recent United Nations report. In the wake of the whale's death, three global companies - SeaWorld, Ikea and Royal Caribbean - recently announced plans to remove plastic straws and bags from their properties.